Applied Medical has headquarters in the U.S. and, most recently, Europe. The Europe team requested to add their address, phone number, and 15 European distributor addresses to the Contact Us page of the corporate website. At the beginning of this request, I uncovered a major issue during the research phase: users had trouble finding any distributor information and were turning to our Customer Team for answers, which greatly affected our Customer Team’s efforts and time. Our goal was to meet the Europe team’s needs and also solve for the international users who needed to find distributor information. Approximately 17% of visitors selected the “Country” drop down directly, in hopes of country-related information to appear! I then developed a user motives chart with the team to brainstorm why users are visiting the Contact Us page and to challenge the U.S. team to think globally. We brainstormed and problem-solved on ways to include all distributor contact information, with the goal of visibility and accountability for distributor communication. 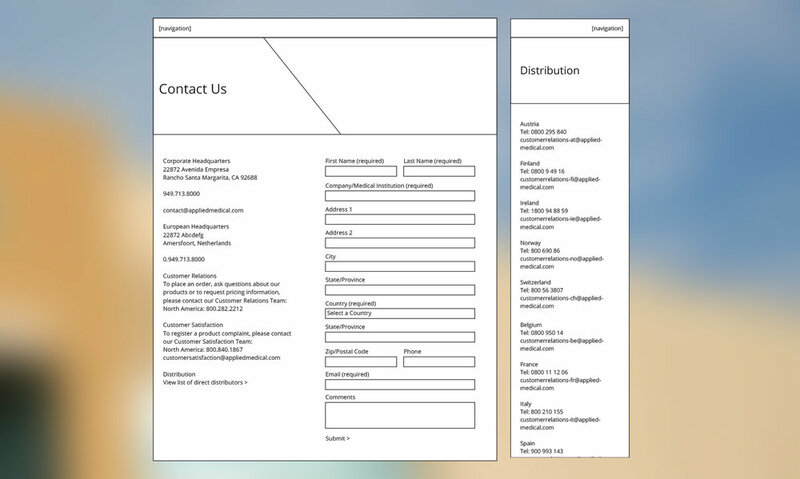 We designed wireframe recommendations to meet needs and worked with designers on the high-fidelity prototype and our designer created pixel-perfect mockups of the new pages. The redesign met business objectives and saved time (and money!) for the global Customer Relations/Customer Service team, a team of 75+ team members spanning from the U.S., Europe, and Australia. Previously, the Customer team had to spend time each week to direct customer emails and phone calls to the appropriate distributor of that country, but with the new Global Contacts page, there was less efforts needed to redirect our customers. The redesign and additional Global Contacts page resulted in an intentional decrease of users who would click directly on the “Country” drop down field, which shows that our redesign was successful. The Global Contacts page was utilized over 3,000 times within the first 6 months of launch and the heatmaps show users selecting the email addresses they need, so we understand that the page is being used as intended. This type of project, a web-based project with UX insight, was new to Applied Medical and there were some internal processes that might need future attention. My hope is that UX research will be more upfront in the process. For this project, I learned to share my findings early on to all team members, even in cases where they think it’s not needed, as a small step in educating the team on UX research. I also learned that with international communication, information was easily lost in email chains. It was clearer for me to video chat with international team members to make sure we were on the same page before moving on. If a call wasn’t possible, our team utilized screenshots in our emails. Web Developers: Eric H. and Joe T.